You may be receiving the most surprises, but I think the ones I receive are just about as often and even more appreciated. Perhaps you aren't expecting a letter quite so soon again but today two ships came in... one from America and the other from New Zealand, going to the States. So, I received mail a week or two before we expected the ship to come in, and get to answer it on the same day... really that is a record for down here. We expect the one going to America to leave tomorrow or Sunday so I am preparing this letter to send. Today I received letters from you, Grandmother A., Naomi, Fern, and Bro. Newman ($2.50). Outside of hearing you are all well and happy, the best news I received was the clipping Fern sent, about the 18th winning the District tournament. Wow! I guess I'm still very much interested in the game of basketball. I thought maybe it was a thing of the past for me, but I surely would have liked to been on even the bench that night, (though I wouldn't trade places with anyone.) Now the Tournament in S.L. is all over so I'll be waiting for results on that. Teie ohipa, i paranhia, pana opaa. Removing the coconut from the husks. Also native dress while at work. Pareue cloth for dresses. Things are surely tightening down on us here these days. It seems even the Gov. doesn't respect us anymore, and that we are here by suffrage and not by rights. (so we have been told.) But, after all, this is war-time and whatever we do we must respect the Gov. under which we live.... Art. of Faith # 12. If they say, "close down", I'll be seeing you soon; if they don't, I may go deer hunting with you in the Fall, Dad. Glad to here you all like Bishop de Mik. I assure you I am as close behind him as anyone and know I'll respect and enjoy his being our leader. Dad, now I'll answer your few questions: Do the natives cultivate the soil? Well, I really don't believe I've seen a native owning anything that resembled a farm. We always have fresh vegetables, here on Tahiti; such as green corn, string beans, cucumbers, radishes, onions, potatoes (sweet), onions, watermelon, beets, oh shucks, most everything you have and then some... only we get them all year 'round. The farmers, however, are the Chinese, of whom about 1/5 of the population on Tahiti consists of. (Taking the Leewards and Tuamotus this number isn't quite so high.) 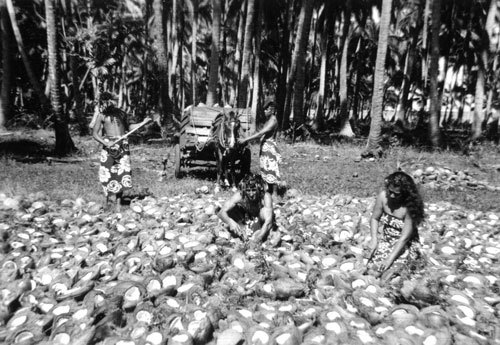 If a native owns any land at all to speak of, he raises coconuts..... they grow by themselves, pick themselves, and all the native does is dig out the "meat" as this picture I am sending shows. The general tendency of a native is to not work hard as a rule, and yet I wouldn't say they are lazy because even though they are slow, they are good workers... and they usually have to work hard to earn their living. I guess all nations have different classes of people. Now in answer to the question, yes, the soil is cultivated, but, by the Chinese. The next: How do we handle $ bills out on the Islands? Well, if we ever get one we usually take it out, look at it good, say, "Now that looks like real money", put it in a box, and there it stays until we reach H.Q. where we add it to our account or change it into francs. We receive 43 f. to the $ now. (I forgot to say, we usually feel it good, too.) 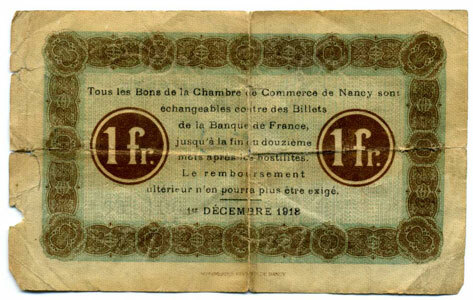 We have to carry so much French money on us to make up any amount at all so it gets tiresome. 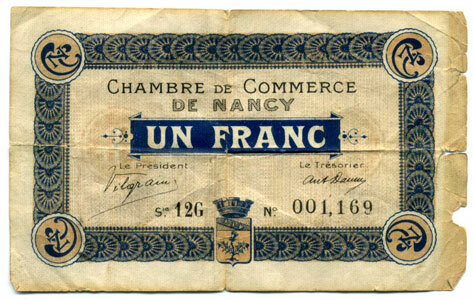 One franc is worth about 2.32 ¢ and comes in .05 centimes, .10 centimes, .25 centimes (or a quarter of a franc) .50 1 f. (in metal), 5 f. 20 f. and 100 f. bills. It's really a purse full to carry $5 in. Now the 4th (This is much easier to write letters this way than to just tell it and guess what you want to read about.) A typical meal at H.Q. usually consists of soup (vegetables and lots of them) fresh beef, potatoes and gravy and a green vegetable.. lettuce or watercress. For dessert, with a course of that, we usually have cantaloupe or watermelon. Another course is as follows: creamed carrots or peas and potatoes.. sometimes American, but more often Tahitian.. more green vegetables, and dessert of ice cream.. vanila or chocolate or fresh pineapple, Oh yes, our big roasted fish usually accompanies this course. Other days we have raw fish (pickled in fresh lime juice.) spinach, and anything that sounds good. Then more desserts of fruit salad.. bananas, oranges, iita (papyrus) vi (mango) and fresh pinapple, jello and chocolate raisin cake. This is all a fact so don't doubt any of it. No kidding, we really eat good. Now: What is the length of the summer days? Gee, when is summer? I can hardly tell there is any change of seasons here but I understand this is Fall now and winter is coming on. I arise just at daylight ten minutes to six these days and the day usually passes quickly and I retire around 10:00 P.M. but it gets dark right soon after six. And really gets dark quickly. I'll let you know more concerning this next winter. I've forgotten just what time it does get light and dark then. Now the last one: Yes, we have access to the radio once in awhile. Pres. has that in his rooms or quarters so when we ever spend an evening in there we get to hear it. He tells us all the news that has any interest at all. Cal. isn't the only place we get. I've heared K.S.L.lots of times. Well, I hope this satisfys you on that score. Write more.. concerning anything you would like to hear about. Elder Hunting and I are going over to band concert for an hour so I'll finish when I get back. .. .. .. .. .. ..
Another bit of work that has kept me a little busy since writing last is translating of Section 88 of the Doc. & Cov. into Tahitian. Surely wish I knew this language better when it comes to that type of work. I finished that Sec. however. Now concerning my stock in the wallpaper... I'll be glad to buy two or three or more months share in it. I'm afraid you have more stock in me than it's worth so why not invest in something else? And Dad, I'm surely close to the goal of being able to say the Gospel is true... I know this, I wouldn't trade it for any other as taught by "uncalled" ministers. You will never have to worry about me not trying to live according to it's teachings. Mother, don't work too hard at that job of yours. Keep yourself well and happy. And don't ever worry over me; you really shouldn't; nothing can happen as long as I am living straight and doing as you want me to. I guess I'll go to bed now and write more letters in the morning. If I don't stop soon I'll have this one overweight. There will be another ship along in a couple of weeks or so so you can expect another soon. P.S. I surely would appreciate newspaper clippings of anything interesting. (Bad writing, don't you think.) I'm way out of practice. P.S. It looks as though I'll be here for quite sometime yet, working in the office. We still don't know who our new Pres. will be. I guess that's all the news.